As I stepped into the Gothic Theater in Denver I immediately felt the electrifying energy of the crowd. Fashioned in outfits right out of a speakeasy, the men looking spiffy in suits and hats, while the women dressed to impress, in classy dresses and harmonizing accessories. Caravan Palace poured their enthused and genuine talent into the crowd, a feat that is lacking in the electronic scene. Inspired by Django Reinhardt, Vitalic, and Daft Punk, the group created a unique blend of sound that evokes a child-like happiness. They creatively meld the sound of familiar instruments such as the clarinet, xylophone, double bass, trombone, violin with a vibraphone and turn tables to make an organic yet vivid electronic sound. Extraordinary violin and clarinet solos caught everyone’s attention as band members amused each other with fresh solos. 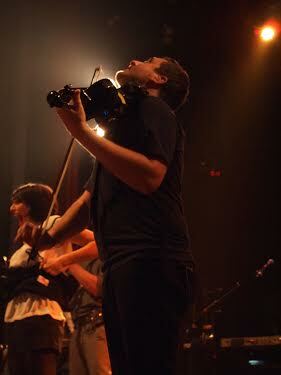 In addition to their distinctive sound, Caravan Palace performed phenomenally on stage as entertainers. Each lively member shared their own magnetic personality and connected with each other and the growing audience. Lead singer Zoé Colotis fronts the group with sultry vocals that bring me back to listening old crackling vinyl at grandpas house. Her endearing and exhilarating dance moves must have been adopted in jazz clubs in Paris along the way because they were matchless to anything else. 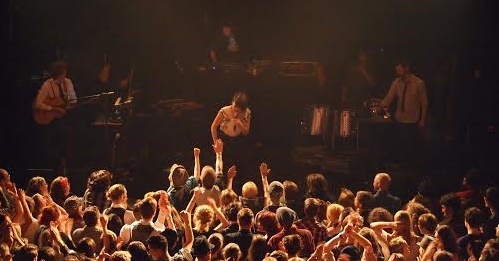 Zoé’s enthusiastic dancing inspired the audience and band members to shake a leg with her all through the night. After an encore and the crowd screaming for more the band thanked Colorado for being so lively. Zoé joked about doing her cardio workout for the week and the band left the stage leaving the audience elated. I went into this show with very high expectations after seeing some videos of their live shows abroad. I'm happy to say my expectations were met, and then some! I have never felt such a heightened sense of euphoria. Caravan Palace brightened the night for many as the audience filtered out filled with more liveliness than when they arrived. If you have not heard of this experimental style of electro-swing, I highly recommend this band.